"The Rhythm Composer TR-707 is a fully programmable rhythm machine which allows you to program 4 Rhythm Tracks or tunes (altogether 998 bars) from up to 64 kinds of user-created Rhythm Patterns. Each of the 15 digital drum voices is extremely realistic and has a separate output jack for individual mixing, echo or equalizer. The TR-808 was OK in its time. It just didn't sound like real drums. When the Linn Drum machines appeared, the 808 seemed doomed. But its unique sound and analog allure have found it a long-lasting home in many forms of music. 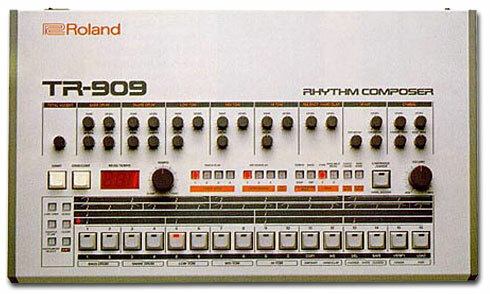 Clearly the 808 has been one of the more important and famous drum machines in the history of music, spawning imitators (ReBirth, DrumStation) and band names (808 State). Famous users include Orbital, Überzone, Download, Aphex Twin, 808 State, BT, Bomb The Bass, Sense Datum, The Prodigy, Josh Wink, Faithless, Skinny Puppy, Bushflange, Jimi Tenor, A Guy Called Gerald, Eat Static, Dr. Dre, Jimmy Edgar, Jimmy Jam & Terry Lewis, Freddy Fresh, Richie Hawtin, Jean Michel Jarre, Cocteau Twins, Marvin Gaye, Luke Vibert, LL Cool J, Ice Cube and Puff Daddy. Extremely popular today, especially for dance, it is used by 808 State, Air, Bushflange, Future Sound of London, Moby, Norman Cook (Fatboy Slim), Orbital, Hardfloor, Überzone, Underworld, The Prodigy, Faithless, ATB, Eat Static, Jimmy Edgar, Sense Datum, Richie Hawtin, A Guy Called Gerald, Astral Projection, Josh Wink, Freddy Fresh, Jean-Michel Jarre, Luke Vibert, the Chemical Brothers, and many more! It is armed with Roland's DIN Sync and MIDI, individual outputs, external memory cartridges, and an essential shuffle & flam for great grooves. Use it as a sound module or program patterns, songs and beats into it...either way you'll be in analog drum heaven with the 909! The first drum machines were built in the 19th century. They were real drums that were struck by automated metal arms with a beater attached. These machines resembled a traditional player piano, but had percussion instruments also. These old machines sometimes known as nickleodeons (sometimes as music cabinets and an assortment of other names) are a blast to watch. The designers were very clever to figure out the sofisticated mechanics! Officially the first drum machine was the Chamberlin Rhythmate in1949(at least I'm told). It was quite a machine and it started a revolution that is on going to this day. Then came the Wurlizer Sideman in the 1950's. It was a primitive machine with its tones generated mechanically. This machine almost started a riot at the musicians union. Boy were they MAD! By the early eighties, the analogue drum machine had evolved considerably. It was no longer a part of the organ, but an instrument in its own right. Its various sounds could be tweaked - the snare drum made snappier, the open hi-hat given a longer decay, and so on - while maintaining its distinctive character. More importantly, it could be programmed by the musician to play new rhythms, which opened it up to new musical genres. Another feature that made it more studio friendly and more professional was the inclusion of a separate output for each of the parts of the virtual drum kit. This enabled musicians to use different effects, such as delay and reverb, on each part of the kit, and allowed each part to be equalised seperately. Despite all these useful features, however, it still failed to sound even remotely like an acoustic drum kit. Meanwhile, at the higher end of the market, the digital drum machine was released. As it featured samples of real drum kits, it sounded very much like the real thing, and its analogue counterparts became very cheap very quickly. The drum machine had finally become realistic, although it was far from perfect - the sound of the acoustic snare drum alone varied immensely based on where you hit it and how hard, whereas the digital drum machine typically had only one or two snare drum samples. The same was true of most other parts of the drum kit. Realism was attained at a cost: the sounds could no longer be expressively tweaked. The other way to get synthetic percussion sounds - in particular, the tweakable sounds of the TR-808 and TR-909 - is to buy a clone. Several exist, including the Novation Drumstation and the Jomox Airbase99, both of which are 1U rackmounts and MIDI compatible, making them fit into a studio much easier than even the originals they are designed to emulate. 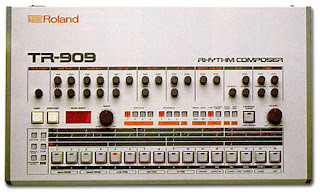 Roland TR-909 Since it was released in 1983, this has become even more popular than the TR-808. Together, the pair have been used to provide the main rhythms of a lot of techno and house music. The Sideman was good for the technology of its day, but it was simple and not too reliable (just like some friends of mine who play drums).... lighten up, just kidding! It is a great historic piece of gear and it had a great cabinet! The Korg Company of Japan was formed to produce rhythm machines, and they released one of the first all-electronic called the "Donca Matic". This machine was more reliable, but was still very simplistic and unrealistic sounding when compared to a real drum kit. This new technology opened the floodgates and many companies started to offer rhythm units. Most of the new units improved at about the same pace as the home computer. That is to say FAST. Each week, someone had seemed to solve another problem or came up with a new sound that added warmth and realism. The famous Kent drum machine was released soon after the Donca Matic. The K-100 model is said by some to be the first "real" drum machine. Several U.S.A. companies started making drum machines in the late 1960's and early 1970's. Seeburg and Maestro being two of the better known. Wurlitzer came out with new models and Hammond, Conn and other organ manufacturers soon followed suite. The main reason for the organ companies to be the ones who developed the drum machine technology was simple. They were developing the technology to offer home music machines that could make the music of an entire band. This was quite a selling point. Their efforts still effect us to this day, as none of the digital and sampling revolution would have happened without the extreme foresight of the organ companies! Anyway.... if a customer had an older organ that didn't have onboard rhythm, the solution was simple. Offer a drum unit to the organist as an "add on" to their older unit. Thus the drum machine had an instant market. The Roland Corp started was started as an offshoot of the Acetone Co. in the late 1960s. 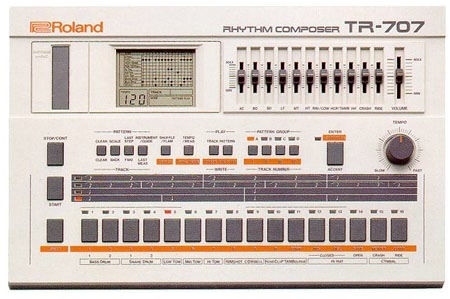 The FR-1 Rhythm Ace was extremely popular and helped generate the Roland Corp. In 1972 Roland developed its first drum machine.They produced the first programmable drum machine in 1975 and they have been one of the leaders in the field ever since. The digital revolution of the 1980's saw a multitude of changes in the way drum machines were made and used. Many new companies started making drum machines. Yamaha, Linn and Oberheim joining Roland as industry leaders. Today drum machines have more than a few drum tones or samples, they hold hundreds of sounds, some including bass, keyboards, guitars etc. You might call them "band machines" other than drum machines. An entire generation has grown up on the sounds of Hip Hop, which wouldn't have been possible if it weren't for the drum machine! Let's first look at how the drum sound is produced by the machine. Either a machine uses mechanical or tape sounds like the Chamberlin, aanalog drum sounds like the ones found on the legendary Roland TR-808 or uses sampled sounds like those found on a Boss Dr660, for example. The analog sounds are created much like a sound created on a synthesizer, but are finely tuned for a certain snare or kick drum sound (not to mention other drum or percussion sounds). On the other hand, the sampled drum sounds are actual recording of drums that can sound just like the real thing. Some drum machines, like the Akai MPC 2000, even let you sample your own drum sounds (which makes it a favorite among most hiphop artists). Most new drum machines come with an onboard sequencer. This allows you to arrange the drum sounds and get the groove flowing the way you want to. Drum sounds can either be entered in real time (which means you bang away on the drum pads and record what that sounds like) or in step time (which means you arrange the drums step by step). In real time, the drum sounds can be quantitized, which means if your timing is a little off, it will move your drum hits to the closest ½ note, ¼ note, or whatever timing the drum machine will allow. As far as step recording goes, many drum machines allow you record your drums in 16 steps. This method became popular thanks to the Roland TR-X0X series (tr606, tr808, tr909, etc.). This allows you to create simplistic, yet killer beats very easily and effectively. Some newer drum machines also offer a lot more advanced way (but not necessarily better way) of programming your beats. On some machines, you can break down the measure to up to 420 parts (depending on the drum machine) and really get down and dirty in your programming. This makes the possibilities almost limitless, but also takes a lot of effort and care to get everything flowing well. Lastly, you can control your drum machine with a separate midi sequencer (you're going to hear the word "midi" a lot on hiphop). You can use a hardware or software (ie: computer program) sequencer to program those beats just like you want them. This allows you to have extra flexibility in the way you want to program your beats and lets you pick the best programming interface for you. When you pick out a drum machine, also take note of how much you can edit the individual sounds. As far as these options go, they vary from machine to machine. But keep in mind that you want something that is flexible and that you won't get tired of. You also want something that will be able to adapt to your style if you ever decide to change up your sound a little bit. One last thing to check out on drum machines is how many outputs they have. On a Roland R8, for example, you can assign drum sound to any of the 8 individual outputs on the machine. What this means is, you can use different effects, equalization, and mixer setting on each of your drum sounds. You could distort the bass drum and put some reverb on the snare drum to make it ring out more. Although this feature is definitely not essential, it does make your machine more flexible and helps insure you won't get bored of the sound and outgrow your drum machine. Of course, the most important thing about the drum machine you get is if you like the sounds. They have to be able to make you happy and inspire you to make great music. All of these features I mentioned are nice, but if the drum machine isn't making the beats that make people's head bob, then there's no point in getting it. So choose wisely, producers, and good luck with your new toy. BeatBox! * BeatBox! * BeatBox! * BeatBox! * BeatBox! * BeatBox! * BeatBox! * BeatBox! * BeatBox! * BeatBox! * BeatBox! * BeatBox! * BeatBox! *BeatBox! All of us have heard of synthesizers. However, when most people think about them, they imagine an electronic keyboard that imitates the sounds of a piano. However, these machines could be used in many different ways. And many professional musicians use synthesizers for imitating sounds of drums and other percussion instruments. If this is the case a synthesizer is usually called a drum machine. Drum machines could be very useful and convenient in many situations. Sometimes during recording sessions a live drummer is unavailable and a drum machine could perfectly substitute him. Many drum machines today are programmed to be able to create and to manage computer generated music. These machines are able to reproduce sounds of various percussion instruments. They could be programmed with the desired drum beats and then simply turned on when needed. First drum machines appeared in the 1930s. They were called rhythm machines and were somewhat different from the ones that are available today. The first rhythm machine was called the Rhythmicon. This device could produce sixteen different beats. These beats could be played on their own or in various combinations with each other. The Rhytmicon was very popular after its invention, but it did not become popular among musicians and was forgotten rather soon. The following drum machines were inflexible and could produce preprogrammed rhythms only. They were mostly used for playing tango and mambo as well as some other types of Latin music. Drum machines were not popular until the 1950s. This is when the Sideman was introduced. This drum machine was the first one to be produced commercially. This drum machine was developed and sold by the company that produced organs and jukeboxes as well. Initially, the Sideman was designed to serve as an accompaniment for the organs. And during the long ten years drum machines were produced to fulfill this function only. But in the beginning of the 1970s drum a wider group of people got interested in the drum machines. In the 1970 the first pop song was released where a drum machine was used. And since then drum machines have been gaining their popularity. They are widely used in music industry today. The first drum machines used analog sound synthesis. Unlike them the modern versions of drum machines use digital synthesis. That is why the result sound of old and modern drum machines differs a lot. These differences make some musicians use earlier drum machines in their music to get unusual sound. With the beginning of the 21st century drum machines’ popularity has been decreasing. Other types of modern software are now available for musicians and this leaves drum machines behind. It should also be noticed that not all musicians approve the use of drum machines. And many professionals still prefer acoustic drums.